If ever there was a book that illustrated the “reading at whim” principle elucidated in the last book I reviewed, it would be this one. I did have a complete set of Chekhov’s plays sitting next to my bed, as well as a huge volume of 20th-century Russian history that I’m about a quarter through. But I chose to read the San Francisco Giants baseball team book instead. And really, who can resist the story of these loveable misfits from 2010, am I right? I only suffered for 34 of my 43 years to finally see my team enthroned as The World Champions, and since it may never happen again, I figured I’d get the commemorative DVD (it’s great) and Andy Baggarly’s book that tells the whole goshdarn story from start to finish. You know what? I’m glad I did. 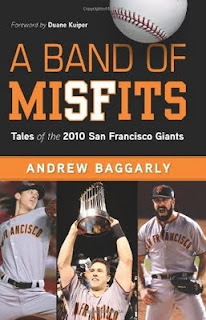 Baggarly’s one of the Giants’ beat writers, and covers the team for the San Jose Mercury News. He also puts together one of three essential Giants blogs, EXTRA BAGGS (the other two are McCovey Chronicles and El Lefty Malo). He really nails how flat-out lucky us Giants fans were in 2010, and how well this team represented the weird, hang-loose spirit of San Francisco. What are the chances that a team so likeable would be the ones to finally win the tile for our city? The past decade was spent under the shadow of the immensely talented but execrable Barry Bonds, to say nothing of Jeff Kent and the fading veterans this team continued to run out of the field, year after year. We kept waiting for some true homegrown talent to make us proud & show us the organization actually understood how to build a team, and until pitchers Matt Cain and especially Tim Linecum, we waited. And grumbled. And yelled. And ranted on talk shows, so much so that when the Giants (finally!) decided to cut Bonds loose, they hastily signed Barry Zito to the biggest pitching contract in history to quiet the baying hounds, a signing that’s been an unmitigated disaster despite the professionalism and good spirits of Mr. Zito. Then came 2010, the year everything went perfectly. It wasn’t a foregone conclusion that the Giants would even sniff the playoffs, let alone win the whole thing. “A BAND OF MISFITS”, breezily and in sentimental fashion, recalls the pieces that needed to fall together to make the magic happen. Dynamite homegrown rookies like Buster Posey and Madison Bumgarner. Career seasons from the likes of Andres Torres and Aubrey Huff. Deadline signings of castoffs or never-was-ers like Pat Burrell, Cody Ross and Javier Lopez. The incredible Brian Wilson, arguably the "most interesting man in the world". And of course Tim Lincecum, “Big Time Timmy Jim”, my favorite ballplayer, a pot-smoking beanpole long-haired freak who absolute dominated on the pitching mound expect for one (freakishly) bizarre August when he couldn’t dominate anything. Relive the glory, from April to November – it’s all here. At least half the book is a game-by-game recap of those amazing Padres, Braves, Phillies and Rangers series that got us to the history books. If you’ve read this far you’re probably one of a tiny handful of the already tiny handful of Hedonist Jive readers who cares about sports, baseball and/or the San Francisco Giants. I’ll grant that to spend even a few hours with a book-length recap of the 2010 season is more than most fans can stomach. Not me. I want it by the forkful. We Giants fans are a skeptical lot, and even now, with our team in first place on June 21st, 2011, there’s a lot of teeth-gnashing and talk-show dialing about the “woeful state of the team”. We may never see a year like 2010 again; nay, fans of all MLB teams would have been more than fortunate to have cheered on a team with individual and collective stories this compelling. I think I can say that objectively and at least half-believe it.